I have the most brilliant friend, a trained teacher, who constantly inspires me with the activities she does with her girls. 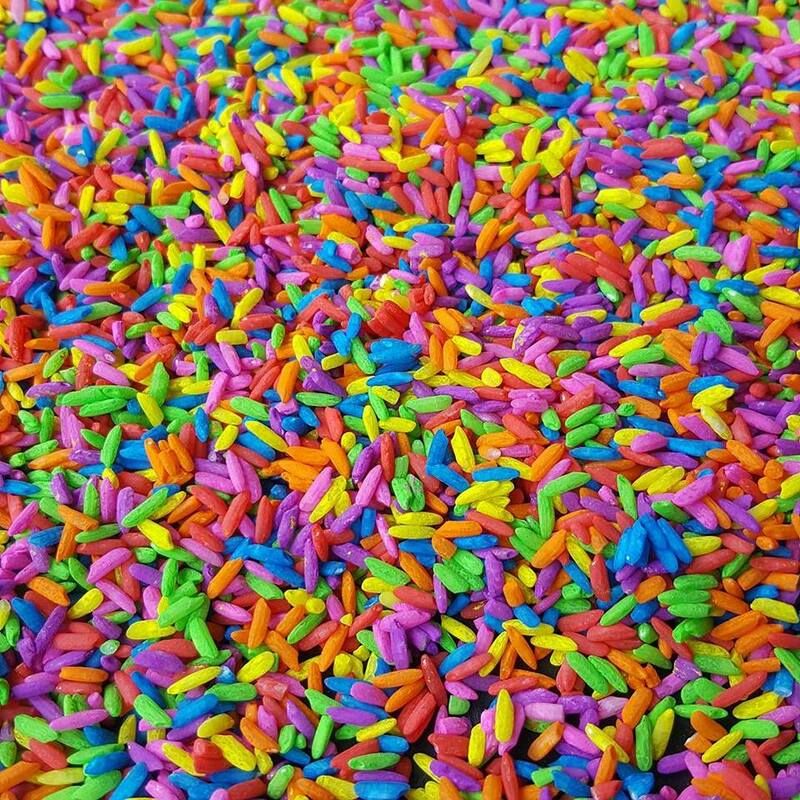 One of her favourite activities is this gorgeous rainbow rice – a wonderful sensory activity for various ages. I asked her if she’d share her activity here on Mommalikeme, so here it is! Our guest momma today is Natasha Pritchard! I grew up with Tash as kids in Francistown, Botswana. Coming from a big family, she was always great with kids, and went on to train as a Primary School teacher. She has since settled in the UK with her husband, and has two gorgeous girls – Paeyton (6) and Phoebe (3). With the precarious English weather she has to continually come up with fun activities to keep the girls busy indoors, and this rainbow rice is just one of her favourites! She continually inspires me, and all her friends to be creative and do more with the kids. Now, over to Tash! I first came across the idea of rainbow rice while searching the internet for ideas to help a child with sensory problems. As a teacher, my interest was piqued. It was an instant hit with both the child I was trying to help and my then 18-month old daughter. This has become an all-time favourite in our home. I’ve tried a number of rainbow rice recipes, but this is definitely our best. It doesn’t require vinegar like some of them, and the colours are just so vibrant! Add 2 cups of rice to the Ziploc bag. Squeeze in a good blob of ready mixed paint and a few drops of the essential oil of your choice. Zip up the bag, and rub the paint into the rice until well coated. Tip the rice onto a baking tray or sheet of tinfoil and spread it out into a thin layer to dry. On a warm day, it will only take about an hour to completely dry. Once dry, it’s ready to play with. If stored correctly in an air-tight container, the rice will last for months! Phoebe waiting for the rice to dry! We practiced our colour sorting! I printed and laminated some coloured crayons, hiding them in the sensory bin, and Paeyton had to find and match them with the colours stuck on the wall – great for early colour recognition!